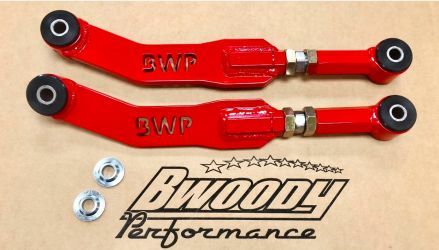 Bwoody Rear Upper control arms are adjustable for any lowering spring on the market. They give you the ability to adjust longer than OEM and are a necessity when lowering your Jeep to make sure it can be properly aligned. Whether installing Mopar, Eibach, Road Magnet Mid level or Extreme drop this control arm will work for you!! Hardware, instructions and grease fittings are included with each kit. Our control arms also offer polyurethane bushing, thus greatly reducing flex in the suspension which greatly improves handling. Custom made to order: please allow 2-5 business days for manufacturing - call for lead time. NOTE: BWP Logo is no longer cut into this item.